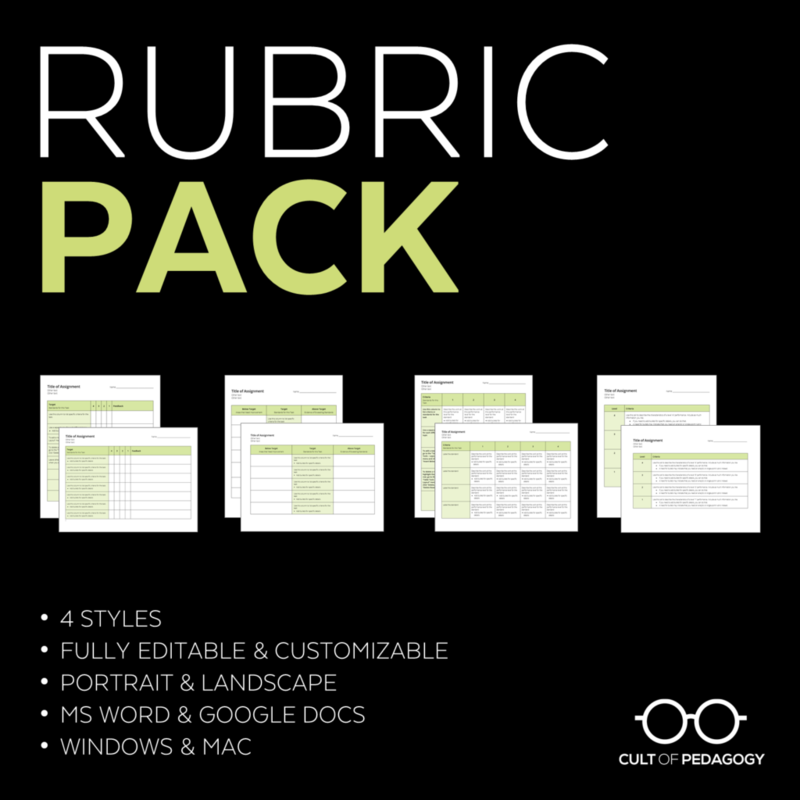 I have written several posts about the different types of rubrics—especially my favorite, the single-point rubric—and over time, many teachers have asked me about the most effective way to convert the information on these rubrics into points. Even if you are moving toward a no grades classroom, as a growing number of educators are, you may still be required to supply points or letter grades for student assignments. Despite the title of this post, all I can really offer here is a description of my own process. It has been refined over years of trial and error, and the only evidence I have to back up its effectiveness is that in over 10 years of teaching middle school and college, I can only recall one or two times when a student or parent challenged a grade I gave based on a rubric. This is by no means the only way to do it—I’m sure plenty of other processes exist—but this is what has worked for me. Before I get into the specifics of the scores themselves, I’m going to describe all the things that happen before those points go into the grade book. I’ll do this with an example scenario: Suppose I want my eighth-grade students to write a narrative account of a true story. This will not be a personal narrative, but rather a journalistic piece that illustrates some larger concept, such as the story of one student’s chaotic after-school routine to illustrate the problem of some kids having too many activities and homework after school. I would also consult with my standards and curriculum materials, to make sure I wasn’t missing something relevant and to make sure the language in my rubric is aligned with those standards. If you have been working with single-point rubrics, you know that the left-hand column is reserved for indicating how students need to improve. The right-hand column has a different title than what I have used in the past. In earlier versions I titled this column”Exceeds Expectations,” providing space to tell students how they exceeded the standards. I have adapted it here to “Above and Beyond” to make it more open-ended. It can be a place to describe where students have gone beyond the expectations, or it could be a place where the teacher or the student could suggest ways the work could reach even further, a place to set “stretch goals” appropriate to that student’s readiness and the task at hand. Once my criteria have been defined, and if I will ultimately be giving points for this assignment, I need to decide how to divide those points across each category. Assuming a total of 100 points for this assignment, I would weigh certain components more heavily than others. 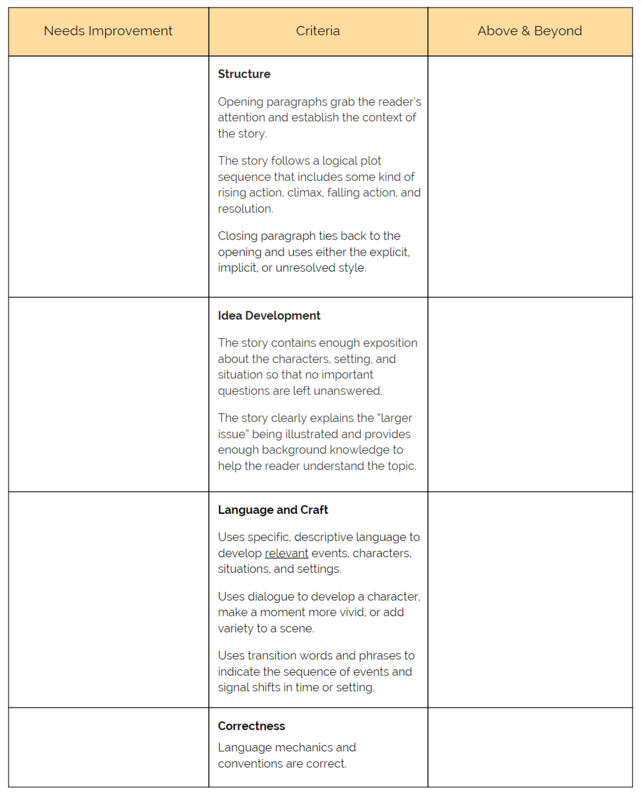 Because my main goal is for students to write a robust, well-developed story, I would place more value on the top two categories—structure and idea development. This is an area where subjectivity can take over, and where rubrics can really vary from one teacher to another. So again, keep in mind that this is what it looks like for me. This part is crucial. Even if students are not included in the development of the rubric itself, it’s absolutely vital to let them study that rubric before they ever complete the assignment. The rubric loses most of its value if students aren’t aware of it until the work is already done, so let them see it ahead of time. 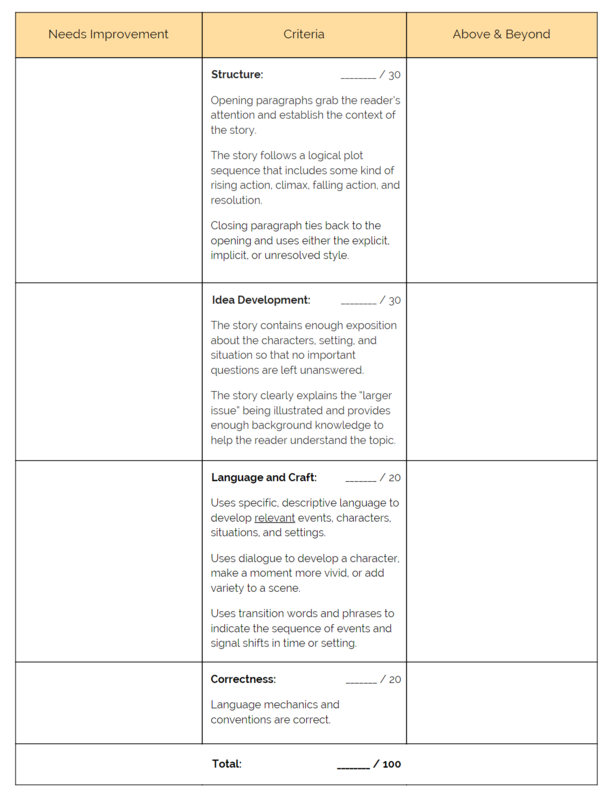 I typically provide students with a printed copy of the rubric when we are in the beginning stages of working on a big assignment like this, along with a prompt that describes the task itself. Another powerful step that makes the rubric even more effective is to score sample products as a class, using the rubric as a guide. I often created these samples myself, building in the kinds of problems I often saw in that type of writing. Occasionally I would use a piece of writing from a previous student with their name removed. Ideally, we would score one or two of these as a whole-class activity, and then I would have students do a few more in pairs. This process really gets students paying attention to the rubric, asking questions about the criteria, and getting a much clearer picture of what quality work looks like. When it comes time to craft their own pieces, they are better at using this tool for peer review and self-assessment. I put a check beside the criteria that has been satisfied in that draft, and add comments to the left of those that need work. In the right-hand column, I add a few suggestions for ways this student might push herself a bit more to make the piece even better. You’ll notice that the space for scores has been left blank. There’s a reason for that: When students are given both feedback and number or letter grades, their motivation often drops and they tend to ignore the written feedback (Butler & Nisan, 1986). My own experience has proved this to be true; I have often spent hours giving written feedback on student writing, but found they often ignored that. Now I know this was because the feedback also included a grade. No-grades advocate Alfie Kohn, in his piece From Degrading to De-Grading, recommends that teachers who want to avoid this effect “make grades as invisible as possible for as long as possible.” With that in mind, in this round, students only get feedback, not scores. Keep in mind that much of this feedback could be generated with the student, in a conference. If time permits, you could sit with the student and go through the rubric together, noting places that still need work and considering ways to take what’s already working and improve it further. Unless the student has satisfied all the criteria on this first try, she will have an opportunity to revise her work and resubmit it, along with the original rubric. Those who did meet all the standards have the option to revise; not for a higher score (since scores haven’t been given), but to simply push the piece to an even higher level of quality. When students have improved their work and re-submitted it, if they have gotten much closer to achieving the criteria, this would be an appropriate time to assign points to go into the grade book. If the issues raised in the first round have now been addressed, they are given a check to indicate that they are no longer a problem. In cases where all criteria in a category has been satisfied, the full number of points will be given. If a problem persists, new feedback may be added, and a portion of the points will be deducted. Again, this is the subjective part: I try to consider the work as a whole and deduct only a small percentage of the total points for a small problem. Really, if a problem is significant, the assignment should be reworked until that problem has been resolved. Once each section of the rubric has been scored, the points are totaled and that total is the score that’s entered into the grade book. Will there be a Round 3? That depends on you and your student. If you feel the student is growing and will put the work in to improve the piece further, and you are willing to assess it again, you should offer another round, and another, if progress is still being made. Doesn’t this process result in most students getting an A on the assignment? It definitely could. If a student is willing to put the time in to satisfy all the criteria, then she will get the A. Those who are used to getting A’s will have the option to push their skills to a higher level in Round 2 or will have the luxury of moving on to something else. It may bother some people that two students who may have different skill levels could end up with the same grade, but behind the scenes, the effort to reach that grade could be very different from student to student. Heck yeah it is. Well, sort of. For me, this type of assignment would be given over the course of several weeks. By the time I have to actually give points, I have seen that student’s piece many times. I have given her informal feedback while she writes and more formal feedback in Round 1, so the time I put into all the stages ultimately results in a final product that’s much stronger than it would have been as a quick, one-time thing. And that makes the final assessment process much faster. Doesn’t this result in students being at different stages at different times? Yes. In many cases, you will find yourself with some students being “done” with an assignment, while others are re-doing it. Most teachers want their students to be learning the same skills at roughly the same time, and unless you are running a very personalized, Montessori-style classroom, you’ll want some kind of consistency from student to student. Consider whether you might be willing to spend only part of your class doing the more lock-step, everyone-on-the-same-page kind of work, but set aside other times for students to work on improving past assignments or doing independent work like genius hour projects. Butler, R. & Nisan, M. (1986). Effects of no feedback, task-related comments, and grades on intrinsic motivation and performance. Journal of Educational Psychology, 78(3), 210-216. Kohn, Alfie. “From Degrading to De-grading.” High School Magazine (1999). Retrieved 19 Aug. 2015 from www.alfiekohn.org/article/degrading-de-grading/. Jennifer…I love the way this process lives up to Kohn’s words of keeping the grade “invisible” for as long as possible. I’ve found that giving lots of feedback makes teaching writing less tedious and more rewarding for me, which I think is antithetical to some teachers’ opinions. Thanks so much for sharing this. I’m going to be trying out a “criteria for success” this year–have you heard that term? I was blown away when I learned about the CFS during some summer PD. It’s much simpler to create than a rubric. It looks somewhat similar to your single-point rubric, so reading your thoughts about how to determine points was really helpful for me in allaying my concerns re: moving away from the busy, text-heavy rubrics I’ve used before. Thanks again! Shari, if you have a link to any CFS materials, I would love to see them, and I’m sure anyone coming to this post would as well. Thank you!! I can definitely share this one that I created for the course I was taking: https://drive.google.com/file/d/0B6kDpYerNa0hV3JlMkFRNVlzanM/view?usp=sharing. This one would be used for an original vignette students would write after reading The House on Mango Street. Credit for introducing me to the Criteria for Success goes to WriteBoston. The course facilitators, who are writing coaches in public schools, explained the CFS as the first column of a rubric. It provides more flexibility for grading, is easier to develop, and is easier for some teachers to use. They reported that students respond positively to the extra white space–which your single-point rubric offers, too. I am going to implement CFS across the board this year in the senior elective for which I am the only teacher–and plan to propose that my course partners and I adopt it for some of our common 9th grade assessments too. I think it could be tricky to align grading practices, but better in the long run for delivering individualized feedback to students. Shari– thank you so much for sharing that. I’m creating a rubric for an assignment and that example you linked to is spot-on for what we’re doing. This is my 18th year of teaching and I still feel like I just started learning all of the best techniques! Gotta reply again– I am having a tough time coming up with stuff for this class (it’s health & fitness, brand new to the school, no textbook, open to whatever I want to teach) and l just finished writing the rubric in CFS style. I’m a little embarrassed to admit that I got a tiny bit teary with relief at how easy that was. THANK YOU again! Abby, I’m so, so glad this was as helpful for you as it was for me! I’m going in to year 5, and I feel so lucky to have found a profession where exploration, reflection, and trying new things are encouraged. I hope we BOTH get to experience the anticipated benefits of this new approach to grading! Would you be willing to share that rubric? Thank you for this! Your examples provide a very clear picture of how this could work in a Literacy class. I’m wondering, have you used this single-point format for other subjects? If so, how does it differ from a language-based assignment? I have been using rudimentary forms of single point rubrics for years now. In my old rubrics I gave more space to the points that to the feedback. I have now shifted that. I did not get exposed to this format until I left the classroom. Now that I am working as a Professional Learning Coordinator I have been both using this to give feedback to teachers on their curriculum work and have been pushing it as the format we should use for rubrics district wide. I am going to share this post with my colleagues since you do a far better job of explaining it than I do. I have been using different headings “Consider for revision” “Proficient” and “Area of strength” In the feedback I have been giving I also tend to write something in proficient to either explain why it was proficient or to push the recipient to think about what a next step might be. I have always struggled with balancing the amount of feedback I give. How much can my students take and how much do I have time to write. I don’t think single point rubrics solve this but they do help us be more focused and they do save time over agonizing what box to put the student work in. Hi Jennifer. After coming across the single-point rubric, it answered a lot of questions for me! I have spread the word in school, and others have taken a real liking to it. This point distribution system also makes a lot of sense as we usually have some kind of “hidden” hierarchy of criteria in our scoring brains. This brings that out into the light. I have experimented using the google docs preferences tool to create comment shortcuts (3-letter/punctuation combinations), so that I can quickly add oft-used comments to either side of a single-point rubric created in google docs. (I got the preferences idea from a post on Google communities.) Thanks for the Blog and the ideas therein! Initially I wondered why people needed this post but I’m really glad I read it. It hits the formative assessment activity I needed for my classes perfectly. Thank you. Just FYI all of my extended tasks are set with rubrics which translate easily to grades or marks (points) because I generally use a 3 or 5 point category scale. With a 5 point scale each item (which comes from my state syllabus) has criteria for grades from A-E or points 5-1. I usually mark out of 15, but it’s easily adjusted to suit the task. Shari – I really like the CFS rubric and I’ve used something similar with the scale. I’m curious as to how you would translate that into a grade? If a student was “approaching expectations” in each category (7, 4, 4, 2, 2) they would have 19 out of 30. As a percentage, that’s a 63, which is close to failing (below 60) where I work (university). Do you then take these points and convert them? Thank you! I am curious about the scoring, too, Shimon. I teach a support-basic skills class, that follows a 7th grade curriculum. 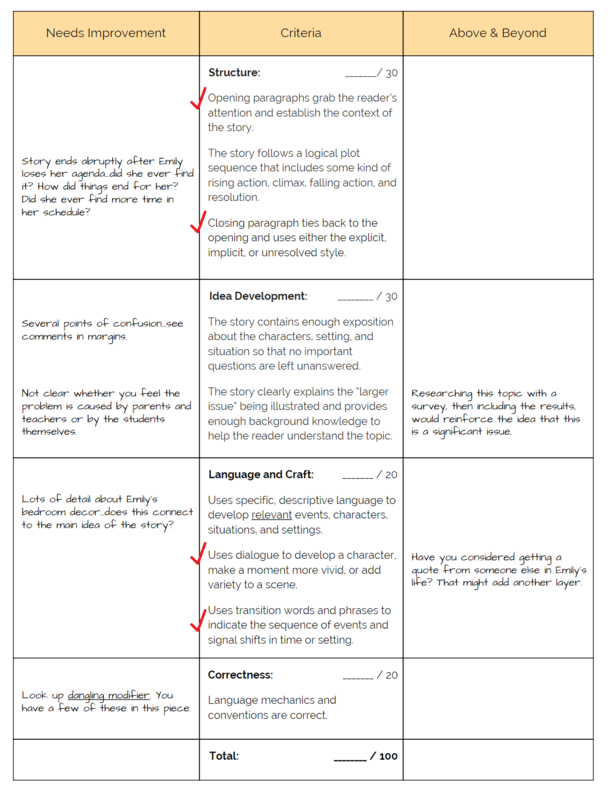 We use a district-wide rubric for our writing, and often my “best score” will look something like 19/32, which is a 59%. How do you go about converting them, please? Thank you for your great work and sharing. I am from Spain, a Primary teacher. I have a question. I am once of those who think grades shoudn’t be to soon because I expirienced it many times. But at the end we have to. How do you go from a 100 to a grade A, and so on? Sory for the spelling and thank you. Hi Angela, this is Debbie, a Customer Experience Manager with CoP. Turning rubric scores into letter grades can be challenging. I’m just wondering…are you wanting to know more about how to convert an overall rubric score to a letter grade? For example, what range of scores is an A, what range is a B and so on? Or was it something else we can help with? Thanks for clarifying. I am really glad I came in and read your piece. I was about to use a rubric structure I’ve used before and I’m going to go to 1 pt w comments for this first assignment of the marking period. I have wanted to make grades as “invisible as possible for as long as possible” for some time and I think this does it better than what I had in mind. It’s less verbose, it puts more energy into the comments than into a rubric that tries to be all things to all people. Thank you! I ended up on this post after listening to episode 94 of your podcast, and then reading the single-point rubric post. While I have been using a variation of a single-point rubric for some time (though I had never heard of the name), I am struggling with your approach to converting the rubric to a grade. The way we approach grades at my school is that a C is meeting expectations – which would mean the middle column on a single-point rubric would score at most a 79%. Anything that went “above and beyond” could earn a B or A grade, and anything that doesn’t meet the expectations would earn a D (or F). Generally, how I do this is to create a scale. The middle column would be worth 2 points (or a weighted version, so multiples of 2), not meeting would be worth 1 point and exceeding 3. Adding up the points possible in the entire middle column would give me the middle of my scale, and I calibrate up and down from there. I’m wondering why there is such a big disconnect in our approaches. If meeting the grade level expectations earns an A, then a student who isn’t meeting expectations in many categories could theoretically still earn a passing grade. Is there research on grading that shows that meeting grade level expectations should earn a grade of A? I really love listening to and reading Cult of Pedagogy, and it has helped me be reflective on my own teaching practice, but I’m curious to hear more from you about this! I guess the disconnect is really in our definition of a “C.” I have taught in two different states and have been a student in many more, plus I also have 3 kids in the public school system, and at no point have I gotten the impression that a C was really viewed as equivalent to “meeting expectations.” There have always been conversations around the idea that C was originally meant to represent “average,” with B and A representing something above that, but I think I would be hard-pressed to find a teacher who thought a student showing 75% mastery was “meeting expectations.” I think this has more to do with the connotation of a C, rather than whatever definition we’ve given to it. 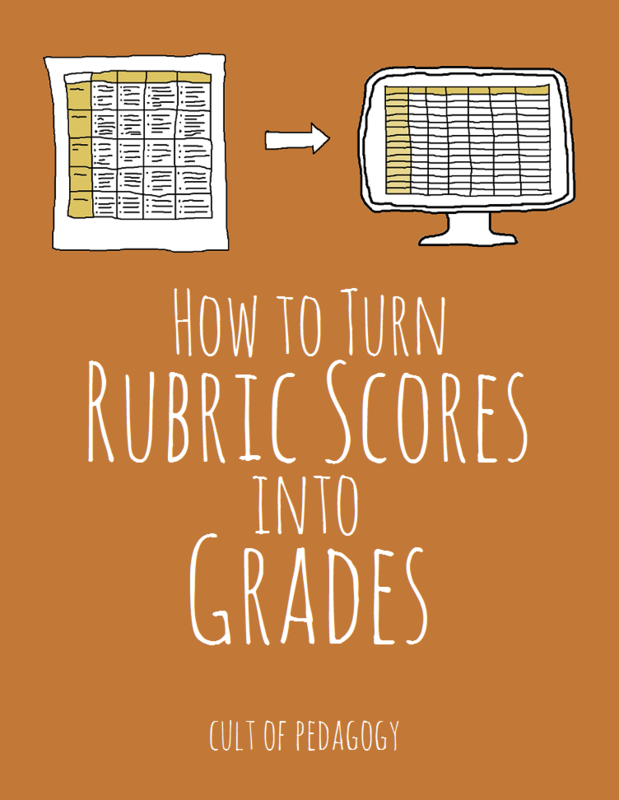 What I’m presenting in this post is how I used both rubrics in a school that gave percent/letter grades, and how all of that was communicated to students, so they understood the expectations. It was not meant to prescribe a specific course of action for all teachers, but to show the process, if that makes sense. So if everyone in your school agrees on what a C, B, or an A means, and those expectations are outlined clearly ahead of time, then you’re good to go. For me, this conversation really highlights the fallibility of grades in general, because if we just gave students feedback and didn’t try so hard to define things with letter grades, our students would get what they need and would probably be better off — it’s so difficult for everyone to agree on what grades mean, anyway. In episode 94 (and the post that goes with it), I mention the Teachers Throwing Out Grades Facebook group. I think you’d find their conversations really interesting.